The elongated pentagonal rotunda is the 21st Johnson solid (J21). 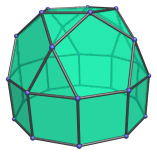 It has 30 vertices and 27 faces (10 equilateral triangles, 10 squares, 6 pentagons, and 1 decagon). 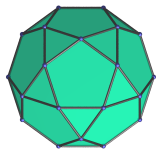 The elongated pentagonal rotunda can be constructed by attaching a decagonal prism to a pentagonal rotunda (J6), lengthening it; hence the name elongated.